Yesterday I was lucky enough to get roped in to Made in Roath 2012 and in particular doing some stuff with ThinkARKs’ “Wish You Were Here?” project. This project took an interesting and alternative approach to the issue of historic and culturally significant buildings ‘disappearing’ from the Cardiffian landscape. 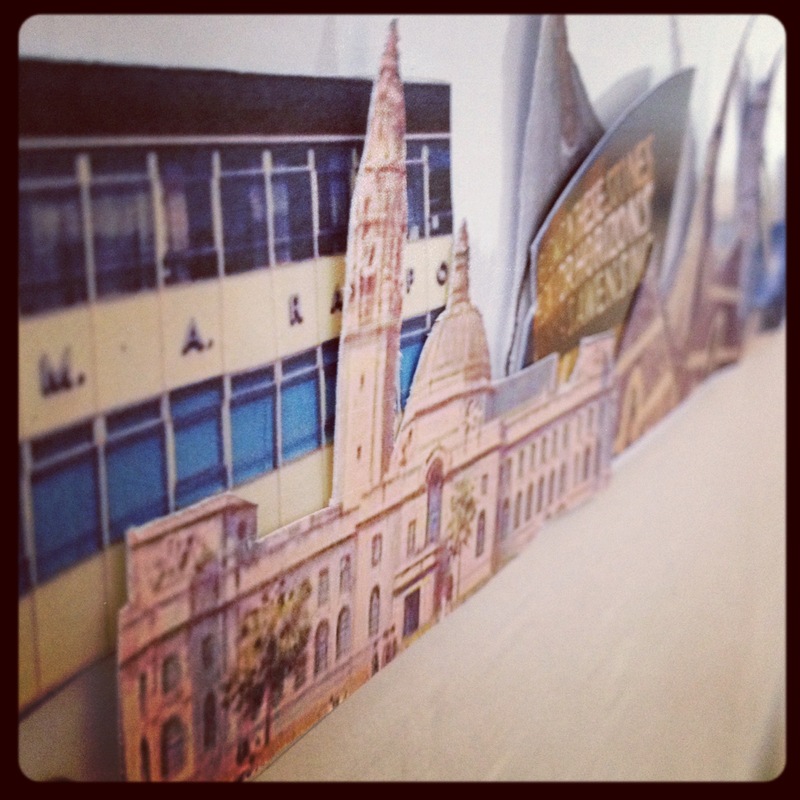 Participants were encouraged to cut out buildings from postcards of the city to create a postcard montage of famous Cardiff landmarks ‘gone missing’. So why am I posting this here? Especially seeing as how the majority of articles I am publishing here are related to computer based and technologically generated art? 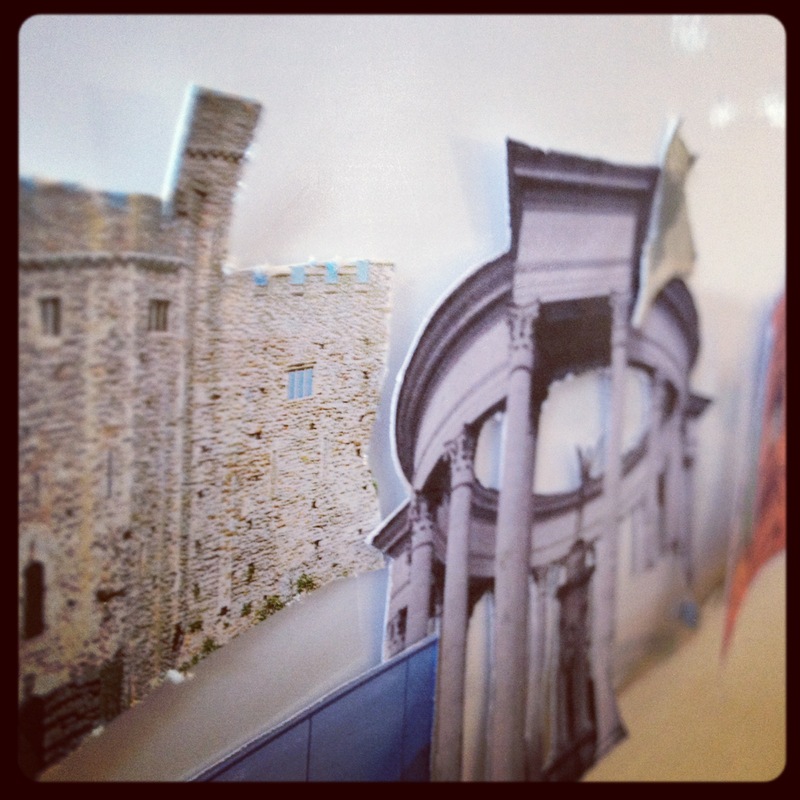 The reason is that by being part of this project I was fascinated by the sense of displacement presented by the cut-outs; both in terms of the remaining postcard and the ‘removed’, inverse collage that was creating an alternative Caridffian skyline at the foot of the ‘gone missing’ images. These days I seem to spend most of my time cutting out or manipulating images on a computer, so for one this was a really nice opportunity to get a bit more ‘hands on’; to have the corporeal, textural feeling of ‘holding history’ and handling memory was a welcome change. Secondly this for me became a experiment in producing detourned artefacts – expressions that may underpin concern around the replacement of heritage with utilitarian concrete monoliths with as much soul as a 1980s shoulder pad….however much soul that is. On top of this discovery of the detourned in and amongst the everyday (that perhaps Vaneigem would enjoy) I was also getting a distinct sense of the derive. I met a few people who wandered in and ended up sharing ideas, experiences and stories around work and creativity that was perhaps more apt to my regular postings around techy stuff and new media art. To top off my sense of the derive and the realisation in some way of the Revolution of Everyday Life I somehow got involved in an impromptu street performance by Denni Dennis Company Clowns……. So another strangely detoruned derive into a world of the everyday turned upside down and inside out…..
Detourned postcards created as part of @madinroath2012 October 2012 in Cardiff.